Find out how ridiculously easy it is to make our Cheesy Mashed Potatoes. 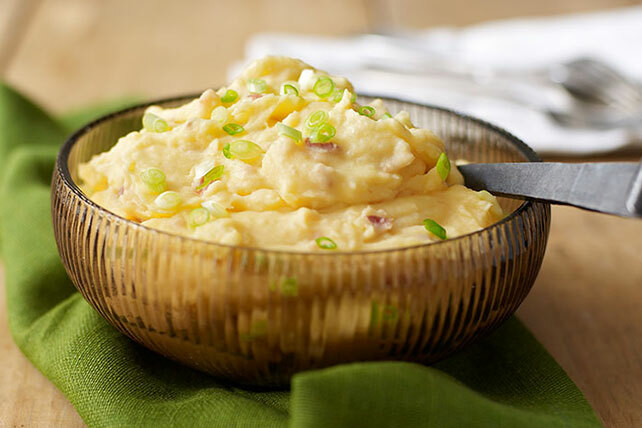 The crowd will roar with approval for our Cheesy Mashed Potatoes with bacon bits. Cook potatoes in large saucepan of boiling water 20 min. or until tender. Drain potatoes; return to saucepan. Add CHEEZ WHIZ and milk; mash to desired consistency. Cool, then refrigerate any leftovers. To reheat, spoon potatoes into microwaveable bowl; cover with waxed paper. Microwave on HIGH 3 to 4 min. or until heated through. Prepare using Yukon Gold potatoes.